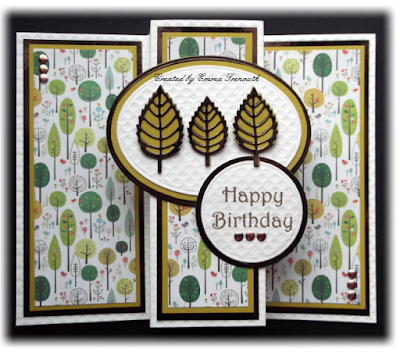 Today im sharing the 2 cards i made for my dads birthday last month. 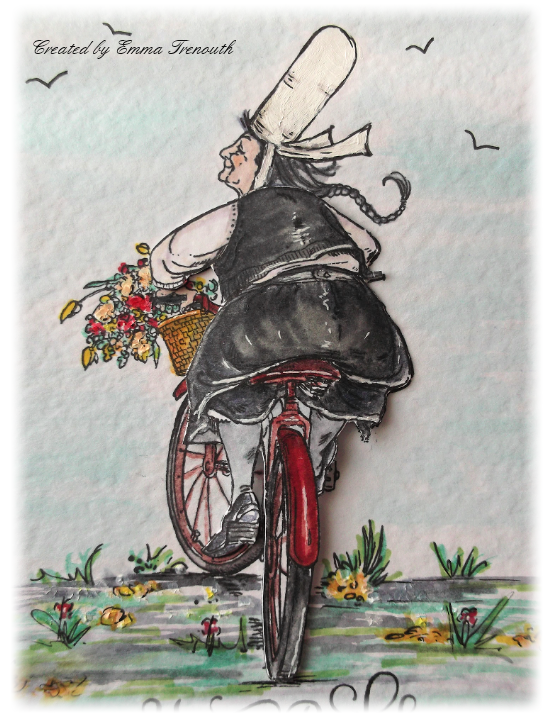 The first one is another one of those triple panel cards ive been making and the second one isn't an normal male card but i was given a lovely stamp by stampendous and a Mo Manning lady cycling image and it just reminded me of fun postcards you can get in France which my dad has collected over the years of going to Brittany. He loved both of them. 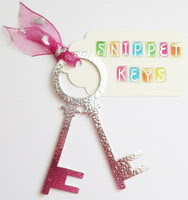 So to make the card blank, take an A4 sheet of card, from the left score 3", 1", 2.5", 1" & 3", cut off the extra on the end. And then cut as high as you like, i used a 6x6" paper so by the time i added my 2 layers for matting it took the card height to 7". You can easily change all these figures, but its a starting point for those of you who asked how i made them. 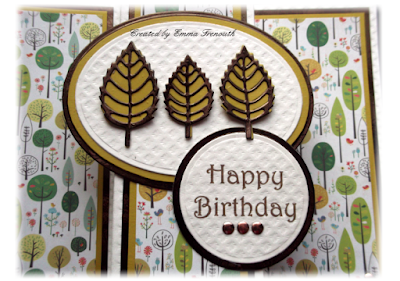 After picking the tree pattern paper i picked out olive green and Chocolate brown mirror card to mat and layer. I die cut the MFT leaves from the olive green and chocolate mirror card and layered together. 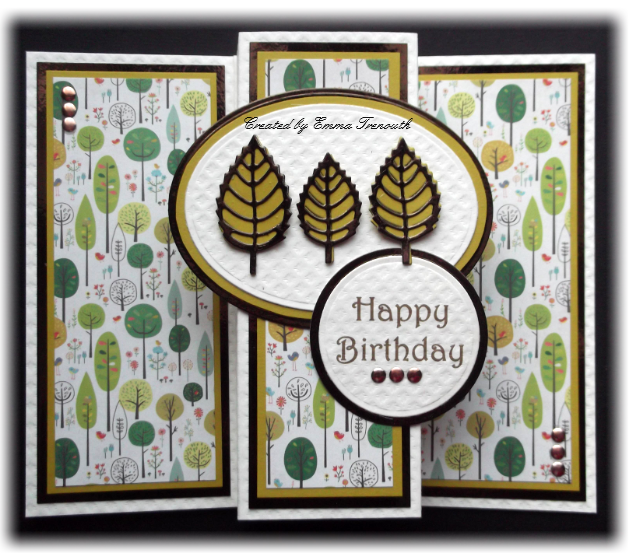 I die cut an oval from the same cream card i used for the base card and layered up on larger ovals. Computer printed sentiment die cut into a circle. Copper nail head gems to finish. Onto the 2nd card i made dad. A5 white cardbase. 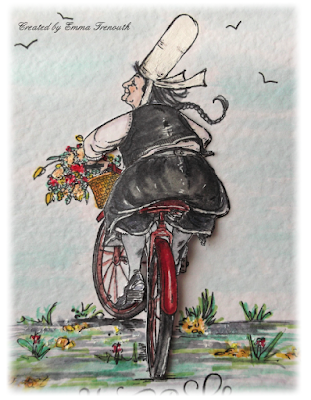 I stamped the image & sentiment onto white hammered cardstock, doodled in some ground and a breton style hat, i then watercoloured with distress inks. 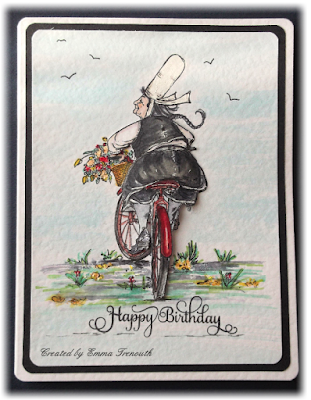 I stamped a second image and cut out and decoupaged onto the first one to add some dimension. Mounted onto black card and then the cardbase. All corners rounded. Two very different cards Emma, love the clean lines and layout of the first and the great image in the second. Two excellent cards for your Dad and I am not surprised he loved them both. 2 fabulous cards Emma - great colouring and doodling on the second one. 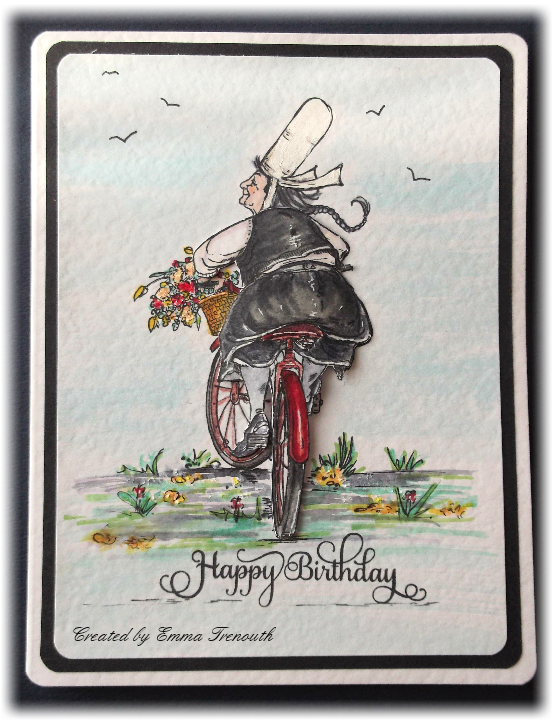 Two super cards, I love how you've doodled in the Breton hat - very clever!